Astana (Kazakh: Астана; former names include Akmola, Akmolinsk, Tselinograd, and Aqmola), has been the capital city of Kazakhstan since 1997 and is its second largest city after Almaty, the former capital. The city is in an isolated location in the center of the Kazakh Steppe and sports a forbidding winter climate - it is the second coldest capital in the world, behind Ulaanbataar, Mongolia. Made a provincial center in 1939, many Russian-Germans were resettled there after being deported under Stalin at the beginning of World War II when Nazi Germany invaded the Soviet Union. Just outside the city was the Akmolinskii Camp for Wives of Traitors of the Motherland, one of the most notorious concentration camps in the Gulag archipelago, which was reserved for the wives of men Stalin considered "enemies of the people." Kazakhstan’s oil wealth has fueled intense building activity in the city since the capital was transferred there. The population more than doubled in the 14 years immediately following the capital designation. Unfortunately, in Kazakhstan’s urban areas, robberies and theft are common, while murder, suicide, and violent crimes are increasing. The drug trade from Afghanistan has given rise to organized crime. Embezzlement, tax fraud, and abuse of power and privilege are tacitly accepted. All are issues that a successful city needs to be addressed. The word Astana in Kazakh language literally means capital city. In Kazakh and Russian, it is pronounced "As-ta-na," while in English and many other languages, the common pronunciation is "As-ta-na." In June 2008, a parliamentary proposal was put forward to change the city's name to "Nursultan," in honor of the then president, Nursultan Nazarbayev - an idea rejected by the president himself. 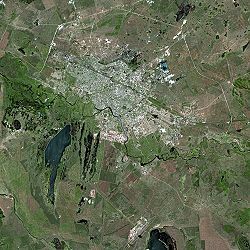 The city is located in the north-central portion of Kazakhstan on the Ishim River in a flat, semi-desert steppe region which covers most of the country's territory. The elevation of Astana is 1138 feet (347 meters) above sea level. Astana is in a spacious steppe landscape, in the transient area between the north of Kazakhstan and the extremely thinly settled national center. The older boroughs lie north of the river, while the new boroughs were located south of the Ishim. Climatically Astana is the second coldest capital in the world (behind Ulaanbataar, Mongolia). The city is known to freeze for around six months every year. The arid city has a continental climate, with cold winters and moderately hot summers. January is the coldest month with an average temperature of 3.2°F (-16°C), while July is the hottest month with an average temperature of 68°F (20°C). Annual precipitation totals 18.9 inches (32.7mm). North of the railway line, which crosses Astana in an east-west direction, are industrial and poorer residential areas. 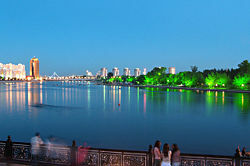 Between the railway line and the river Ishim is the city center, where in 2008 intense building activity was under way. The Avenue of the Republic in the center of town has numerous stores, coffee houses, restaurants, discotheques, and some casinos. To the west and east are more elevated residential areas with parks. A new government administration area is located to the south of the Ishim. The city's land area totaled 274.2 square miles (710.2 square kilometers) in 2008. A symbol of the new Astana for many Kazakhs, Bayterek. A unit of Siberian Cossacks from Omsk founded a huge fortress on the upper Ishim River in 1824. This became the town of "Akmolinsk," which became an administrative center in 1868. During the early 20th century, the town became a railway junction, causing an economic boom that lasted until the Russian Civil War (1917-1923). Astana was made a provincial center in 1939, at which time its population reached 33,000. Outside Astana, there stood the Akmolinskii Camp for Wives of Traitors of the Motherland, one of the most notorious in the Gulag archipelago, which was reserved for the wives of men Soviet dictator Joseph Stalin (1878-1953) considered "enemies of the people." Many Russian-Germans were resettled there after being deported under Stalin at the beginning of World War II (1939-1945), when Nazi Germany invaded the Soviet Union. The city was at the center of the Virgin Lands Campaign led by Soviet leader Nikita Khrushchev (1894-1971) in the 1950s, in order to turn the state into a second grain producer for the Soviet Union. In 1961, it was renamed "Tselinograd," meaning “City of the Virgin Lands,” and made capital of the Soviet Virgin Lands Territory (Tselinny Krai). At that time, considerable building construction took place, and research and higher educational institutions were set up. The high portion of Russian immigrants in this area, which later led to ethnic tension, can be traced to the influx of agricultural workers at this time. After Kazakhstan gained its independence in 1991, the city and the region were renamed "Aqmola." The name was often translated as "White Tombstone," but actually means "Holy Place" or "Holy Shrine." The "White Tombstone" literal translation was too appropriate for many visitors to escape notice in almost all guide books and travel accounts. Despite the isolated location of the new capital in the center of the Kazakh Steppe, and the forbidding winter climate, Kazakhstan needed a more central location than its former location of Almaty, which lies on the far southeastern border with Kyrgyzstan. The official reasons for the move were a lack of space for expansion in Almaty, and its location in an earthquake zone. In 1994 the government began to transfer the national capital from Almaty to Aqmola (named Astana since 1998). The transfer was completed in 1997. To some Kazakhs, the move remains controversial. Critics resent the massive expenditure of public funds to build the new government complexes, as well as the continuing cost of airfare and hotel expenses for the many government workers who still live in Almaty. Lucrative development contracts handed out to companies owned by President Nazarbayev's family members have been questioned. The politics of Kazakhstan take place in the framework of a presidential republic, whereby the President of Kazakhstan is head of state and nominates the head of government. The nature of government is authoritarian presidential rule, with little power outside the executive branch. 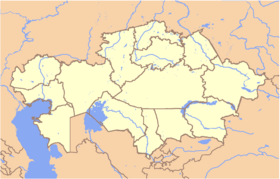 Kazakhstan is divided into 14 provinces (oblys) and three municipal districts (qala). Each is headed by an akim (provincial governor) appointed by the president. Municipal akims are appointed by oblast akims. Astana is located within Akmola Province, although it is politically separate from the rest of the province, which has its own capital. Imangali Tasmagambetov, former mayor of Almaty, was appointed mayor of Astana in April 2008. In urban areas, robberies and theft are common. Murder, suicide, and other violent crimes are increasing. The drug trade from Afghanistan has given rise to organized crime. Embezzlement, tax fraud, and abuse of power and privilege are tacitly accepted. Politics and government are the main economic activity in the capital, which also forms a Special Economic Zone. Since Astana has been the capital, it has been the focus of one of the world's greatest building projects, as oil money has been spent on government buildings, a massive home for the president, a diplomat quarter, a mosque, and numerous parks and monuments. 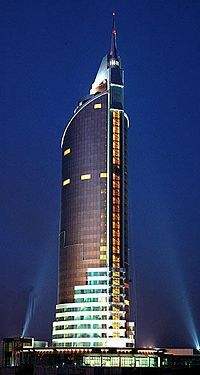 The building project is designed to not only make the town the center of Kazakhstan, but of all Central Asia. The original plans for the new Astana were drawn up by the late Japanese architect Kisho Kurokawa. Astana's chief planner in 2008, Vladimir Laptev, said he wanted to build a Berlin in a Eurasian style. The total floor area commissioned in 2005 was more than one million square meters, which is 112 percent more than that of 2004. From 2001 to 2005, Astana's tourism has increased from 13,339 to 31,441 visitors. The city has become a location for business conferences and forums, thus boosting business tourism. Many inhabitants work for the railways. Industry in the city produces agricultural machinery. Per capita GDP of Kazakhstan was $8318 in 2005, and per capita rank was 70th on a list of 194 countries. 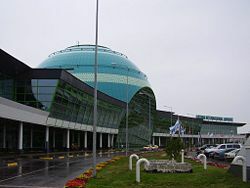 Astana International Airport, located nine miles (14km) outside of the capital was, like the plan for the whole new city, designed by Kurokawa. Astana's first airfield was built in 1931. In 2005, the airport underwent a major upgrade. It handled 834,299 passengers and 2587 metric tons of cargo in 2006. The Astana Metro is a planned underground construction in Astana. Ministry of Communication in Astana. Astana’s population has more than doubled since the capital was relocated there, to about 600,200 by 2007. The population is expected to top one million by 2030. Migrant workers – legal and illegal – have been attracted from across Kazakhstan and neighboring states such as Uzbekistan and Kyrgyzstan, and the city is a magnet for young professionals seeking to build a career. This has changed the city’s demographics, bringing more ethnic Kazakhs to a city that formerly had a Slav majority. Astana’s ethnic Kazakh population has risen to some 60 percent, up from 17 percent in 1989. Russian, which is the official language, is used in everyday business, and is designated the "language of inter-ethnic communication," was used by 95 percent of the population in 1991. Kazakh was used by 64.4 percent. Kazakhstan, which is home to over 130 ethnicities practicing over 40 religions, is aware of the need for peaceful co-existence. Astana hosted summits of world traditional religions, which brought together the main monotheistic religions, in 2003 and 2006. A Palace of Peace and Consent, a stone and glass pyramid, 62 meters high, was planned for the second summit, according to the city of Astana official website. Broadly speaking, Muslims made up 47 percent of the Kazakhstan population, Russian Orthodox 44 percent, Protestants two percent, and others seven percent. Astana's tertiary institutes include the Eurasian National University, the Kazakh National Academy of Music, the Kazakh Agro-Technical University, the Kazakh Humanitarian and Law University, the Institute of Management, and the Kazakhstan University of Economy, Finance, and International Trade, among others. 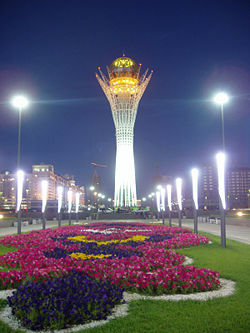 "Bayterek," from the Kazakh for "tall poplar tree," was a new monument in Astana in 2006. It has become a popular tourist attraction, symbolizing the new status of the young capital. The top of the structure is a gilt sphere crowning a mythological tree of 97 meters. "Bayterek" embodies a legend of a magic bird of happiness, named Samruk, which laid its egg in the crevice between two branches of a poplar tree. From the top, it is possible to see much of the newly built city. In December 2006, President Nazarbayev unveiled plans to build Khan Shatyry, a "giant, transparent tent" 150 meters high, over an area of the city. The tent, designed by British architect Norman Foster, was expected to take approximately a year to build. Museums include: The presidential center of culture, the Kabanbay Batyr mausoleum, the Ethnic Memorial Complex, the S.Seifullin Museum, the Modern Art Museum, and the Museum of the First President of the Republic of Kazakhstan. ↑ 2010 жыл басынан 1 тамызға дейінгі Қазақстан Республикасы халық санының өзгеруі туралы Retrieved March 8, 2012. ↑ Almaly district akim, Code of Access Retrieved March 8, 2012. Solovyov, Dmitry and Reuters News Service. Pope Pays Tribute to Victims of Soviet Atrocities Embassy of Kazakhstan to the USA & Canada, September 24, 2001. Retrieved July 15, 2008. Giant tent to be built at Astana BBC News.